*We will not be using AdF.ly links as this is originally work of Nandonalt. 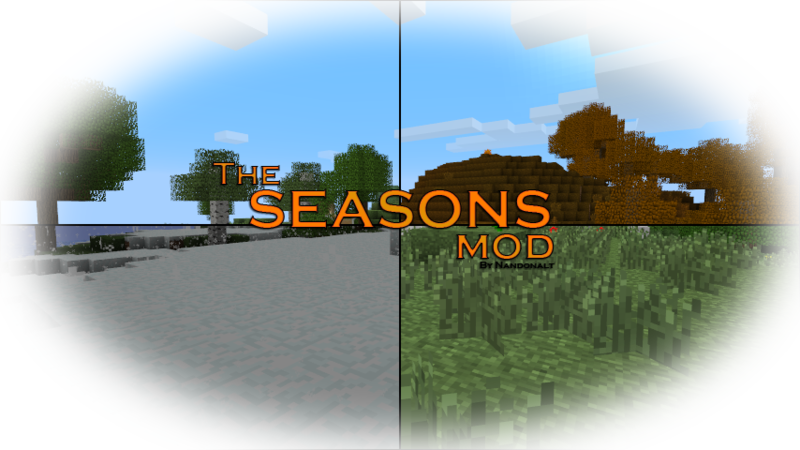 The Seasons Mod has been updated! 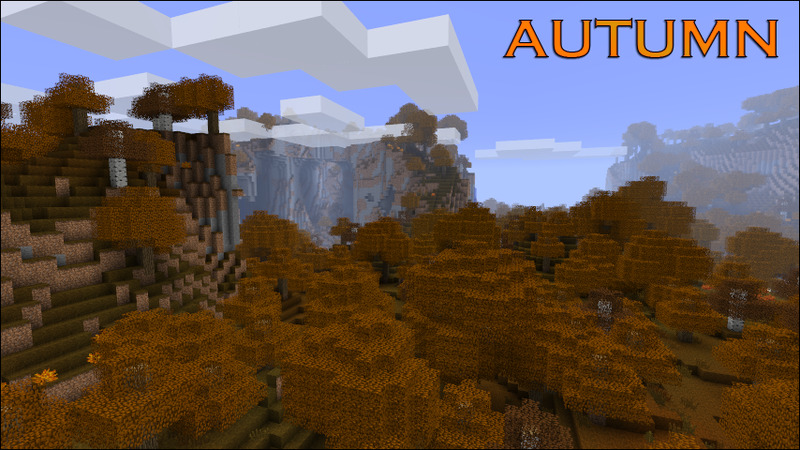 This mod adds the four seasons to Minecraft; Spring, Summer, Autumn and Winter! Most of the features in this mod are configureable, so if you don't want it or want to modify it, go to your config folder in your .minecraft directory. Any mods with these files are incompatible. Q. Will this mod ever be released for SMP? A. When I am finished updating the mod, I will maybe rewrite the code. Then I can make it SMP. Q. Can you make this compatible with OptiFine? A. Trak is working on a patch right now! It should be out soon! Q. Can you make this compatible with Forge? A. Absolutely, that's the next patch he's working on! Q. Why does my shovel not break the grass block faster than my fist? A. That's due to you not having ScotTools installed. All you need to do is drag and drop the contents of the .rar file into your minecraft.jar, not your 'mods' folder. The flowers are no longer gray squares. SeasonsMod is no longer dependent on OptiFine. Fixed ice melting in frozen rivers. Fixed snow melting in Ice Plains. kz.class is no longer a used core class. Winter: It is snowing without any rain particles on the ground or rain sound. Creating/Loading a world without a season will make the world start in the middle of a random season. Restart Minecraft when switching from SSP to SMP. An image will be shown when transitioning from season to season, will disappear after a few seconds. All the rainstorms in Summer will be Thunderstorms. Instead of snowing, it'll only rain in snowy biomes, although, they wont defrost. Another thing, Wheat shall grow 1.5x faster than any other season! If you're in the desert biome, and not protected/under a roof, every time interval, you'll be hurt randomly. The rain will destroy most of the grass generated from Spring. Also, along with Spring, it will defrost the ice/snow generated from Winter in non-snowy biomes. Lastly, days are longer and nights are shorter(disabled). Grass and Leaves have a modified colour to fit Autumn Secondly, flowers' (Red/Yellow) textures have been modified to fit the colour of the grass in Autumn. Lastly, you'll get bonus Wheat whilst harvesting. 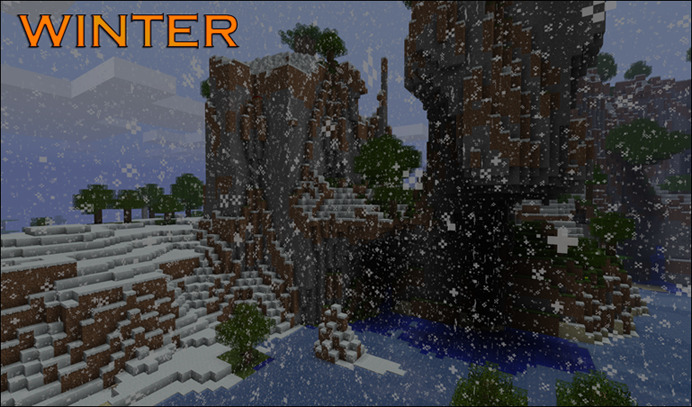 It's always snowing in Winter, except in the Desert biome and in the Nether. Secondly, in Winter, the temperature is really low, especially in cold biomes such as Taiga, Tundra and Ice Deserts, so don't stay out too long, you'll get frostbite. To warm you up in such occasions, just put on full leather armor. Lastly, days are shorter and nights are longer(disabled). Tall Grass and plants (Including custom plants if added inside the config) will grow on Grass Blocks affected by direct sunlight. 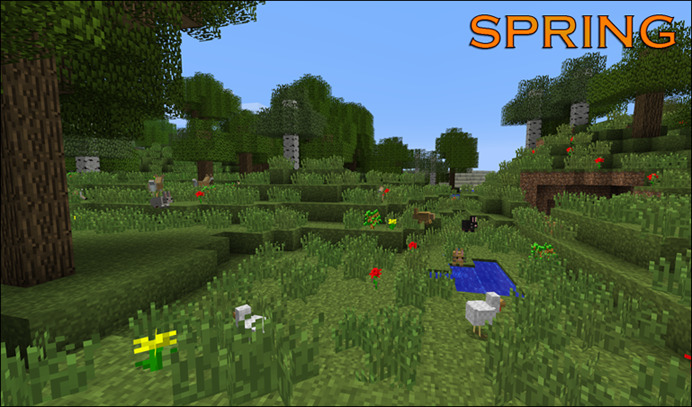 The Seasons Mod also adds two new items into Minecraft! NOTICE: Temperature is not affected by ice, lava or anything, and each X,Y,Z has its own temperature. Say a big thanks to Bockwurst for these. A big special thanks goes to Nandonalt for creating this mod in the first place, it's a shame that he had to stop continuing this mod. Nandonalt - 80% - For creating this mod. Trak - 15% - For updating/reviving this mod. RAWRMaD - 5% - For Beta Testing the mod for any bugs. As you can see, you may get the green siding of the Autumn grass even though it is orange, this is because you are in "Fast," switch to "Fancy" to remove the green sidings. Lag too much? Try the OptiFine Patch! 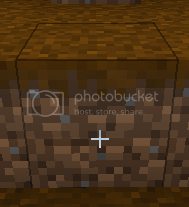 Does not support texture packs larger than 16x16. In the Swamp biome, grass textures are purple. Seasons change when opening a new minecraft. Feature us? We'll post your site here with a graphic, as a thanks! Looks fun, how long does a season last? EDIT: Saw this on gamechaps channel! Well done! Forgot to ask this: Is there any chance you could add a spring biome color change for this, like how autumn has one? 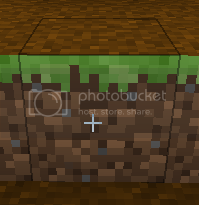 Kind of bluish/green, like DokuCraft High's grass. I've been hoping someone would update this! OMG!!!!!! WTF!! WHAT IS THIS DO MY EYES FOOL ME? 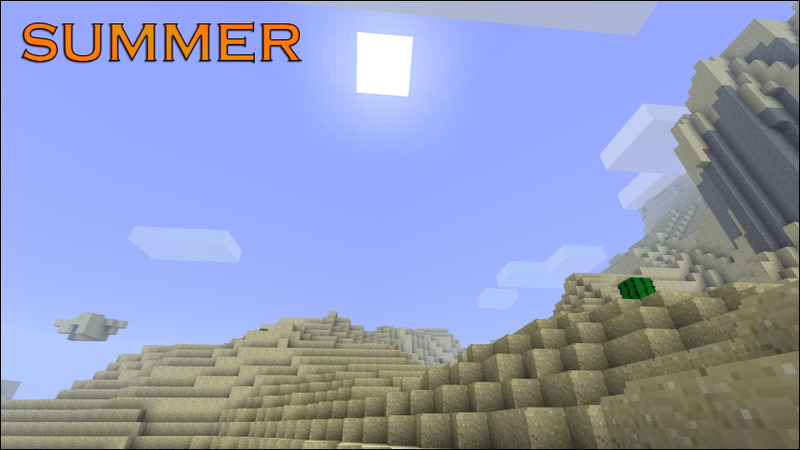 Its the seasons mod for 1.1! OpenGL: ATI Radeon HD 3200 Graphics   version 2.1.8781, ATI Technologies Inc.
Did it happen more than once? Do you have any other mods installed? By just looking at that, it looks like your noBiomesX may be causing the trouble. What mod has a SkyLight or something? Tried to disable Advanced Winter mode but still has the error. Or is it still java.lang.NoSuchFieldError: totalSkyLight? But I emptied jar and backed it up and it works fine in clean jar. Then it's just an incompatibility.